3. Prepare new battery cells. Now we can start with the real stuff. We need 12 new cells which should be connected to have four poles in total. To this end, we first take three cells, all directed with the 'plus' to the same direction and we use some scotch tape to keep them in a row (maintain the structure of the original cardboard roll). Solder the connection points of the batteries. We do the same with the remaining cells. In the end we have 4 bars of each 3 cells. Use a voltmeter to check the voltage of each cell to prevent any surprise later on! 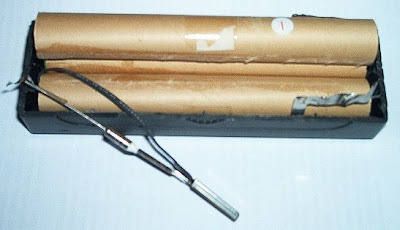 Each bar should have around 3.45 volt (this may vary depending on the battery and age). If there is no voltage shown on the meter check the solder points and check if the batteries inside are not placed up side down. 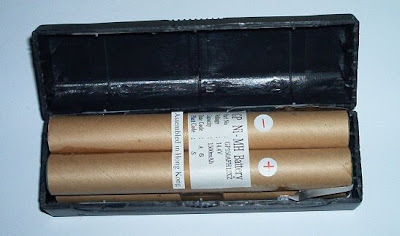 Finally, use paper to create the same type of cardboard sleeve around each roll and tape it. This is mainly to prevent any short-circuiting. Be sure the outer solder points are still visible. The following steps are the most important. You cannot permit to make any mistakes otherwise there is a fire hazard. Read this section completely and follow it step by step. For wiring the cells I used solder points. The cables should not be too thin because later on when charging the battery, the current will rise to about one ampere. First, we place two cardboard rolls parallel so that each side has a plus and a minus. Use tape to package both well together. The two sides of the set should have its poles diagonally the same. The picture will clearify how to do it. From now on, I distinguish the left and right side of the cardboard roll block since both sides are wired differently. I just used the original battery position as an example. You can mark plus and minus on the paper so you don't forget it later. Let's start with the wiring on the left side. Rotate the block so that at the left side the minus pole is below the plus pole. From here solder a bridge to the left up to the plus pole as shown in the photos. Remember the piece of electronics of chapter two? We need this now, because it established the connection between the other poles. Solder the end of the black sheathed cable to the plus pole right down the other end to the minus pole on the top right (see 2). This would be the wiring of the left side. Then go on with the wiring of the right side. Here you just need a bridge from the minus pole on the lower left to the plus pole on the bottom right. Take a voltmeter and check between the two upper poles if there is a voltage of around 13.7 volts. If yes, then you have done everything right. (if not: go back to chapter three and check each step). Now we can start to assemble the battery. 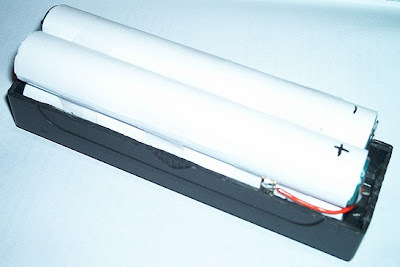 The assembling of the battery is fairly simple. The new battery should easily fit in the housing. If not, you can cut the spacers inside the housing with a wire cutter. Place the battery unit inside so that the right side is where the metal tongues go upwards in the housing. Pay attention to the temperature sensor which shouls not be damaged in any way. 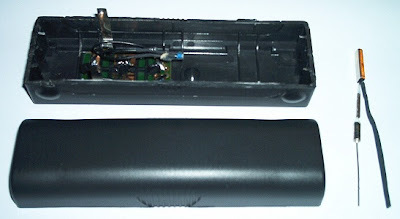 You don;t have to glue the sensor again as long as it is placed underneath the battery unit. Now put the lid back on it. Turn the metal tongues a little bit inside so that the case is not connected to the solder points. The two halves should match again. You can use glue and tape to put back the case as a whole strongly together. Pay attention to the air vents which you should not paste over! Otherwise the battery can overheat when loading. Credits: version: pre-1.0 (30.12.2006), Copyright © 2006 by Timo Weirich. Visit the original german version here. Much easier to go to "Batteries Plus". There repaired my battery for $69.00. Someone is selling a Powre Supply for a 350 portable on Ebay.